In this chapter, mathematical tools to be used throughout this book are given. Starting from notation, this chapter presents spaces and groups first. After that, vectors and coordinate systems are introduced, particularly the body-frame referenced vector expressions are emphasized. Orientations expressed by quaternions are given. Then, linear/angular velocity vectors and force/moment vectors are defined, leading to the rigid body dynamics expressed in a body frame. Two functions to be used in the parameter adaptation are subsequently defined. 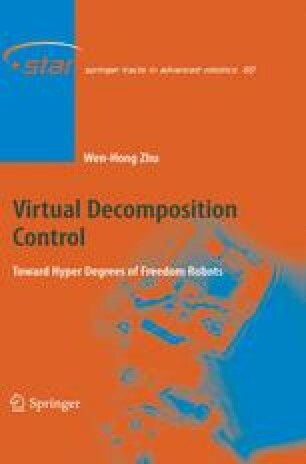 Furthermore, the concept of the virtual decomposition is presented and the terminology of the virtual power flow is introduced, giving rise to the definition of the virtual stability in conjunction with a simple oriented graph. This chapter ends with a formal definition of algebraic loops.